Much has been written about the various crises impacting Uber these days. Much also has been written about how the crises arise from Uber’s aggressive corporate culture and about the need for more maturity in its approach to business and within the leadership team. In fact, the incidents impacting Uber are actually impacting each and every stakeholder a business requires for success. All together these incidents have led to a various public responses and apologies, including promises by the CEO to do better; a company sponsored “independent” inquiry; and, a search for a new COO. Serious stuff on all fronts. In one case, it is being said that “Uber could end up as Silicon Valley’s most spectacular crash” akin to the Drexel Burnham Lambert junk bond crash in the 1980s. Employees/suppliers — the people that make and deliver a product and service. Uber has issues related to the corporate culture; the CEO’s attitude toward Uber’s drivers and ongoing discussion about treatment of drivers, from whether or not to allow tips to whether drivers are contractors or employees . In addition, employees were also apparently concerned about the CEO’s participation on Trump’s advisory council. The VP of Product has left under a cloud. It now also faces a lawsuit related to the technology development for its’ autonomous driving R&D efforts . Global expansion continues to run into regulatory and legal issues, such as recently losing a court battle to stop a London regulator from imposing strict new English reading and writing standards on private hire drivers. Owners/shareholders — the people who are invested in the company. One of Uber’s investors has publicly called for change in Uber’s corporate culture. Another Board member is an active participant with the independent review of the company’s HR policies. There are questions about “Greyball” tech used to deceive governments and whether shareholders can be held liable for Uber breaking laws. The #deleteuber episode apparently led to losing more than 200,000 customers. This, resulting from, “unfairly, many staff members believed, people accusing the company of seeking to profit from giving rides to airport customers in New York during weekend protests against President Trump’s immigration order.” It is not the first time customers have been encouraged to boycott Uber or that there have been negative stories about the Company’s respect and care for customers or its technology use. 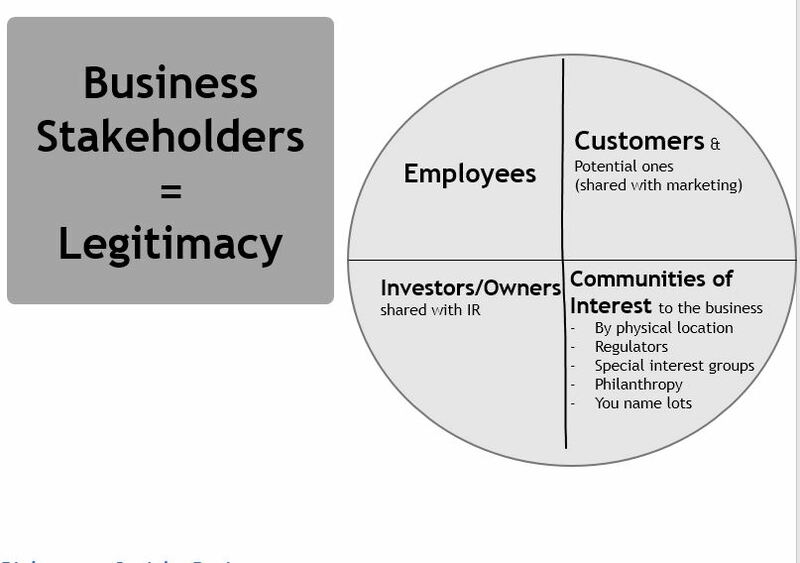 “Communities of Interest” or relevance, such as: geographic locations where a company operates; regulators; schools that educate future employees that a business may have an interest in; philanthropies that a business associates with; sustainability issues a company may need to be cognizant of; etc. In Uber’s case, they have ongoing and aggressive battle with regulators inorder to gain market entry. They have engaged in a worldwide program to deceive the authorities in markets where its low-cost ride-hailing service was being resisted by law enforcement or, in some instances, had been outright banned. There are also questions about whether the company, in its rush to develop autonomous vehicles, was actually “testing” autonomous vehicle in cities where they were prohibited from doing so. Questions also remain about whether the “gig economy”, which Uber is built upon, is fair to “employees”…under current circumstances it is hard to step up to that debate with everything else in turmoil. Where this all leads is hard to know. It could be that all these crises at the same time actually force a fundamental change in how Uber does business, operationally and from a communications perspective. It will need the latter big time, if it rights the ship operationally, since currently the Company is challenged with each and every stakeholder it has. A single recall or hiring a new HR team will not solve these issues. Even a new COO does not solve the fact that every stakeholder group has reason to be concerned with Uber. That makes for a big climb to get out of the ditch and to restore a business to legitimacy.